CASE STUDY: We didn’t cut corners, we covered them! A customer service driven packaging adjustment by Ecocem also delivered production efficiencies. Today they are still reaping the rewards of our incremental innovations. Clear label application secured bags and reduced dust residue. Alternative printing method increased production line efficiency. 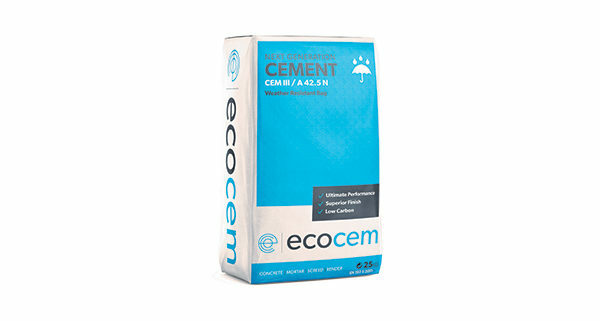 Ecocem fill over 55 tons of cement per hour into 25kg bags for shipping. They approached ALS Labelling Solutions Ltd with a logistics issue regarding their vertically filled bags. Their motivation was customer service driven; their wholesale customers’ end customers were unhappy purchasing dusty bags. Vertically filled bags often contain residue within the valve of the filled bag, which moves during transit. When the pallet starts to move, so does the dust, with haulage causing residue to travel down layers of the plastic covered pallet. Ecocem’s wholesale customers didn’t have an issue but their wholesalers’ retail customers did, dissatisfied at dusty bags soiling their clothes and cars. A modification for ‘crimp & seal’ bags would involve a production line extension, resulting in expensive premises modification as Ecocem’s packing facility is custom built around standing central beams. Ecocem’s Garrett O’Connor identified the potential of using a label to secure and protect the bag’s corner pouch valve. In October 2016 he contacted Pat Phibbs, General Manager, ALS Labelling Solutions to develop a workaround. ALS Labelling Solutions’ challenges were corner labelling a fast moving bag, adhesive iteration and customisation of a labelling machine for the facility’s production line. ALS Labelling Solutions collaborated with the bagging plant team to customise a solution. 6 weeks later after research, prototyping, adhesive work and manual onsite trials to test the design and conditions, ALS Labelling Solutions produced a viable prototype that would suit the plant environment. The customised labelling machine was designed and built over 6 weeks by the experienced ALS Labelling Solutions team at their workshop in Dublin, with their inhouse engineers testing, modifying and troubleshooting the build throughout the process. ALS Labelling Solutions’ full service included the design, build and installation of the machine complete with consumables and support. They worked together with Ecocem to test numerous substrates and adhesives to determine the most effective and reliable material application. Ecocem’s existing inkjet printing system was problematic due to nozzles clogging with dust, which resulted in stoppage time to clean and maintain. ALS Labelling Solutions incorporated a thermal transfer printer for batch number printing into the labelling system, this eliminated inkjet nozzles and the associated down-time for cleaning. The labelling machine was designed to seamlessly integrate into Ecocem’s existing production line. It allows bags to be applied with a clear corner label and relevant batch numbers, all done inline at high speed with no impact on production throughput. Installed in January 2017, the machine labels over 2,500 bags an hour. Garrett reported since the introduction of clear corner labels to 25kg bags, customer complaints regarding dust issues have reduced to zero and thermal printing has improved production line efficiency, eliminating stoppages for clogged nozzles. Ecocem’s commitment to its customers enabled them to improve on their product offering. Their proactive response to customers’ concerns shows a long term view; investing in all their customers along the value chain. ALS Labelling Solutions’ customised and effective response to a specific industry and facility situation demonstrates their expertise and resourcefulness, adding value beyond the brief and future proofing the process. https://labelling.ie/wp-content/uploads/2018/04/Standalone-Bag-Rectangle.jpg 350 600 kieran /wp-content/uploads/2017/04/alslogo-centre.png kieran2018-04-09 14:10:072018-04-09 14:14:24CASE STUDY: We didn’t cut corners, we covered them!